Toronto is on the right path when it comes to reimagined spaces. In the past few years, Toronto has seen a surfacing of value-added elements in unexpected spaces throughout the city. Transportation hubs are doubling as cultural centres, downtown courtyards aren’t just places for the diminishing number of smokers to mingle, and vacant buildings have become food, art, and culture-filled pop-up experiences. As Toronto increases in density one glassy new condo tower at a time, the amount of available space is dwindling; making our spaces multi-functional is not only a nice idea, it’s now a necessity. In a constantly moving city where people seem more disconnected than ever, reimagined spaces bring our citizens together through commonalities in arts, culture, and food experiences—and they can be a win/win for everyone from pavement-pounding artists to developers. 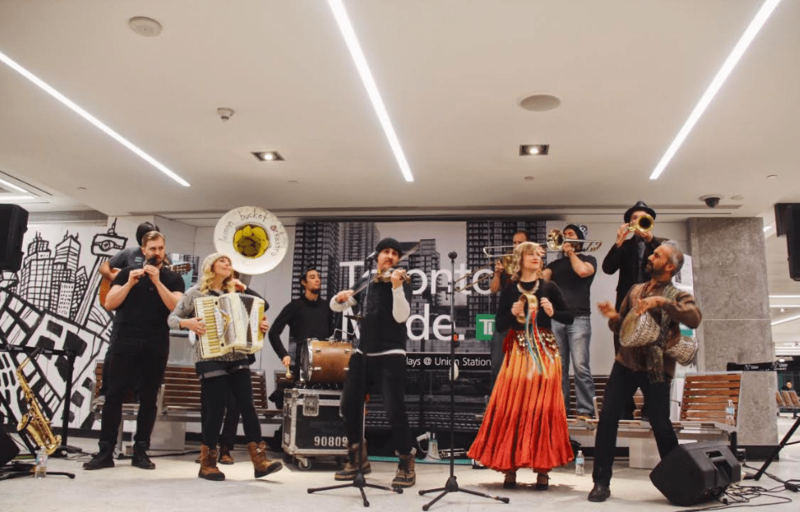 This means live music from up-and-coming local talent every Friday from 4 to 6 p.m. during TD Music Fridays; live drawings of the historic station on the last Sunday of each month (launching November 26); and Union Speaks, a free event series for Torontonians to engage, listen, learn, and network with change makers. Also coming soon is The Legacy Room, an initiative from the Gord Downie and Chanie Wenjack Fund designed to allow people of different cultures and backgrounds to learn about one another. This will also serve as a green room for visiting artists and musicians. A far cry from the dingy McDonald’s of pre-construction Union Station, the station will add local and independent retailers like Leslieville Cheese Market, the Danish Pastry Shop, Greenhouse Juice, and Pilot Coffee. While much of the programming at Union Station is permanent, we’ve also seen reimagined spaces on the interim, pop-up level. 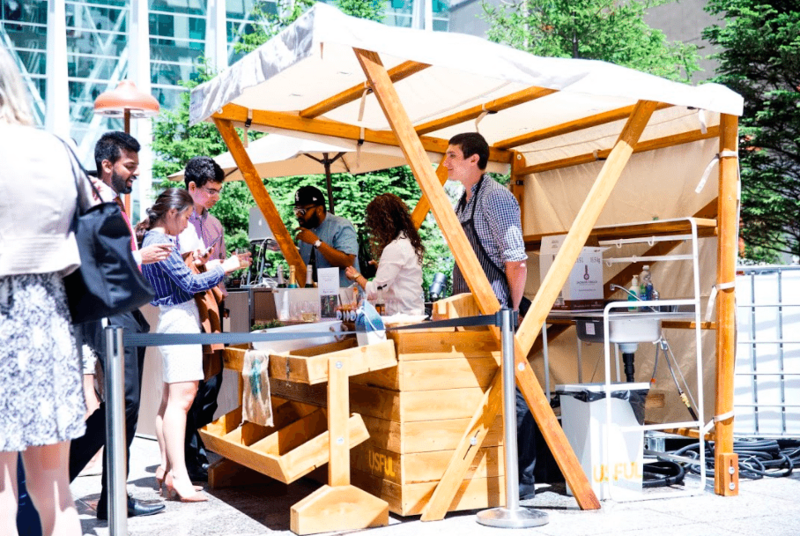 Toronto-based start-up USFUL curates and creates unlikely experiences in Toronto, including a weekly farmers’ market throughout the warmer months in the otherwise concrete-filled courtyards at Bay Adelaide Centre and Brookfield Place. The company sources fresh produce from Ontario’s highest quality farmers to conveniently share with the downtown community via their custom-made collapsible vendor booths. Not only does this support Ontario’s hardworking farmers, it adds more vibrancy to the space and to countless lunch breaks. Toronto has also experienced new life breathed into older buildings and empty spaces—from abandoned factories and an amusement park, to office towers—on an interim basis. In September 2016, Art Spin—a Toronto-based arts presenter known for their large-scale group exhibitions along with bicycle-led art tours—transformed Ontario Place into the In/Future art and music festival. “Having the opportunity to use the entire west island of this decommissioned amusement park, including the iconic Cinesphere, to showcase a wide variety of art projects, literally transforming the space in a way it had never been used before, was one of the most exciting and challenging experiences our organization has had so far,” said Rui Pimenta, co-curator of Art Spin. The nostalgic piece of lakefront real estate will soon see another infusion of the arts. This month, Ontario Place will open its Cinesphere theatre to Torontonians and tourists for regular events and screenings and this winter will bring a series of public events. Toronto’s event scene regulars have also had a chance to get up close and personal with the city’s historic Waterworks building in recent years; the abandoned industrial building has been the site of countless pop-up events—from Toronto Women’s Fashion Week to brand activations that cut no corners. In the future, the mindfully restored spot will become a site for condos, a food hall, and a city park. Earlier this fall, the first-ever EDIT: Expo For Design, Innovation and Technology took over all five sprawling floors of the former Unilever soap factory located at the foot of the DVP. Not only did EDIT inspire, educate, and entertain with its forward-thinking programming (which involved everything from futuristic food dishes like cricket Bolognese, to a prosthetic arm that shoots out glitter and large infographic interactive art installations), it created a buzz about what will occupy the space in the future, that being a commercial development by First Gulf. This wasn’t the first historic waterfront area building to be transformed for creative use. The abandoned Hearn Generating Station became a photo-worthy interactive and art-installation-filled hub for the Luminato Festival in 2015 and 2016. Of course, such initiatives also benefit artists and the surrounding economy. Toronto’s magic-making creative set craves and needs places to grow and develop their craft, but there is simply not enough affordable space. 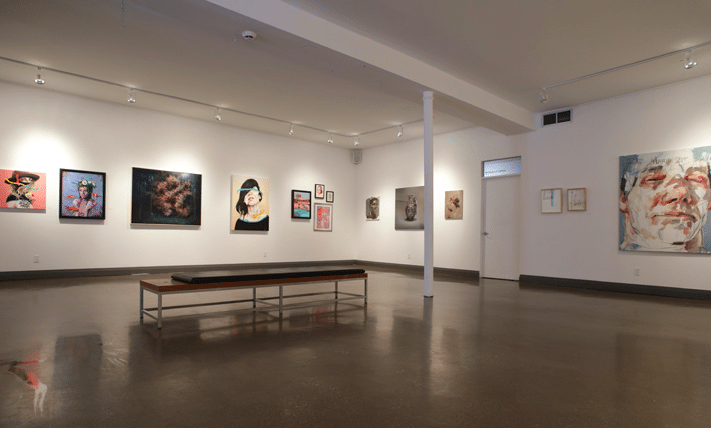 The addition of a steep monthly studio rental fee to already sky-high bills is an unrealistic option for many artists. 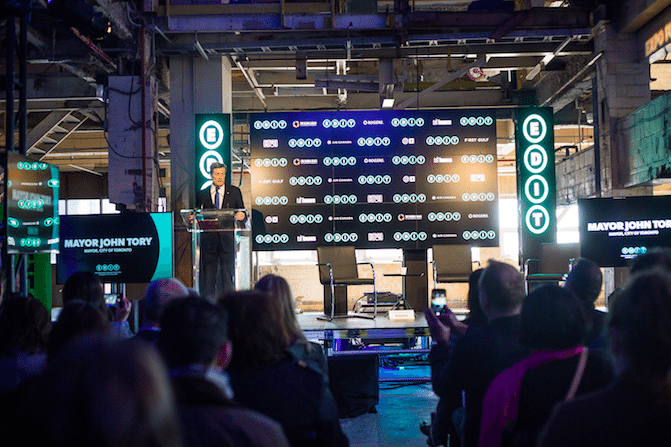 “The creative economy outperforms the general economy in Toronto. Our cultural exports (especially in music) are world-renowned. The use of empty and subsidized spaces enables Toronto to incubate talent authentically, build community and exchange ideas,” said Jacquelyn West, who ran Rally Ossington, a first-of-its-kind placemaking project designed to spark the local creative economy and act as hub for ideas, creative entrepreneurs, and cultural showcase. Held October 2015 to January 2017, it essentially lived as a thriving cultural community centre on Ossington possible because of the accessible space offered by local developer Hullmark. Cabezas has been engaged by top developers, including Streetcar Developments, First Gulf (for their Unilever Soap Factory/East Harbour projects), and recently, those behind the restore of the Paradise Theatre. “Food and beverage, arts and culture, wellness and play experiences should be infused into all developments from the beginning of the master planning process. It’s not just about putting boxes in skies. People don’t want that,” said Cabezas. “What’s the solution? Get the experts who know the creative experiential world engaged at the same time architects, city planners, and engineers are. That needs to be a starting point.” He is currently socializing a concept whereby there could be a fund created in which developers would invest to create a program of experimental activities that could rotate at sites ripe for interim use around the city. The idea is that this would refresh annually. Of course, the idea of reimagined spaces is nothing new; cities globally have gotten creative with old buildings for decades when it comes to adaptive reuse. The famous Tate Modern museum in London, U.K., for example, was formerly the Brickside Power Station. Miami’s Wynwood neighbourhood also offers inspiration when it comes to adaptive reuse. In the early 2000s—following years of economic depression and neglect—innovative developers and property owners got creative with shuttered warehouses, factories, and other buildings, transforming them into the forward-thinking businesses that fill the area today. On a pop-up basis, Manchester’s Warehouse Project is a series of club nights staged in Manchester, U.K., which began in the Boddingtons Brewery in Strangeways before moving to a space underneath the Manchester Piccadilly Train Station before moving to its current location at Victoria Warehouse in Trafford. Currently, there are many buildings sitting vacant in Toronto—ones that offer prime opportunities for creative reimagining and animation. Developers should be incentivized to look beyond Section 37 of Ontario’s Planning Act regarding investments at a permanent stage of a development and realize that interim use of buildings has win/win results. This involves reimagining buildings beyond their bricks and mortar and continuing the creative infusion of spaces, especially given the rapid pace of development. 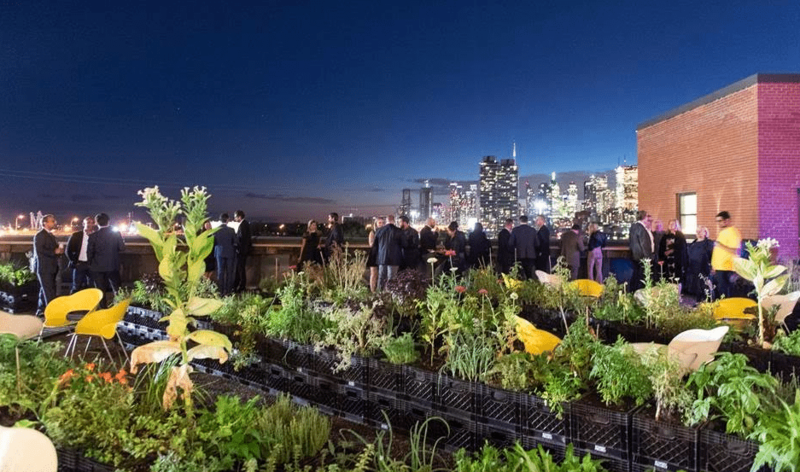 It’s time the city leaders—urban planners, developers, and city councillors—recognize the value in getting creative with these spaces in ways that truly cater to the public good. CORRECTION: An earlier version of this article incorrectly stated that the First Gulf development at the former Unilever soap factory will be a residential development. It will actually be a commercial development.